Nearly identical in design and operation to the PCW, but in a larger footprint to deliver higher heating capacity utilizing a horizontal vessel configuration. 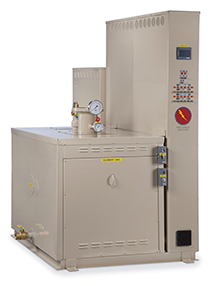 Like the PCW, standard models can be customized to meet unique installation and control requirements. It can be installed where venting a fuel-fired boiler is not an option. The HW can be configured to communicate with any building management system.